A 3 year old boy is brought to an ophthalmologist by his mother for evaluation of his right eye. The child's mother says that when she took a photo of her son 2 weeks ago she noticed that one of his eyes has a white spot in the center of the pupil. When she looked at his eyes afterwards she did not notice any abnormality but found that the white spot was reproduced when a light was shined in his eyes. She says her son has not been complaining of any pain in the eye or has not noticed and strange behavior recently. He has no fever, recent colds or trauma to his right eye. There is no family history of eye diseases. Well appearing child, appropriate development for his age. When light is shined in his eyes, the left eye has a normal red reflex, but the right eye has a central white appearance. His pupils react normally, and he is able to tract objects well. His conjunctiva are pink and sclera are not injected. Fundoscopic slit lamp examination detects a whitish growth involving the posterior wall of the retina. No corneal or lens defects. Retinoblastoma is a malignant tumor of the retina found most commonly in children. 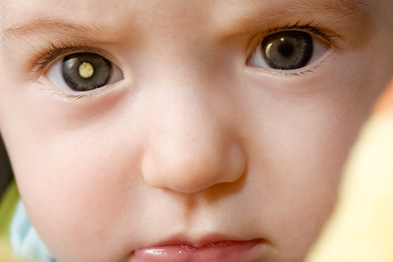 it is the most common intraocular tumor in children. Cause: cases may be due to a new mutation in the RB1 gene or a hereditary gene defect. Initially patients are frequently asymptomatic. With some time they may present with vision loss or eye inflammation. On physical examination the affected eye has a poor red reflex. 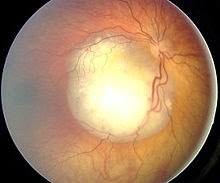 Fundoscopic examination may detect a white mass in the retina. 1. Enucleation is performed for large tumors with no vision potential. 2. External beam radiation may be used for bilateral tumors or those near the optic nerve but has been associated with stopping facial bone growth or causing other forms of cancer. 3. Cryotherapy and photocoagulation may be used for smaller tumors in the posterior retina. 4. Chemotherapy is used in metastatic disease and for large tumors. 5. Overall survival is 85% but this rate decreases with extension of the tumor posterior to the globe.